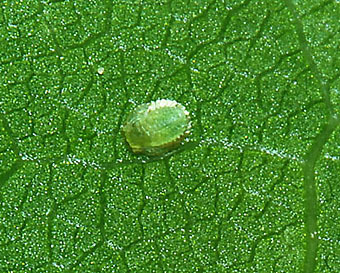 Overwintering eggs hatch in spring and the immature fundatrices (shown below) feed on the developing buds of sycamore or maple. 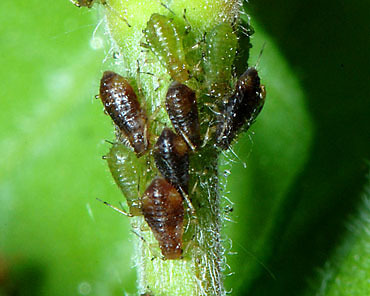 These nymphs develop to give mature fundatrices in April. By hatching earlier than most species of aphids, this generation (reputedly) has few natural enemies, although the formidable array of tubercles, spines and hairs on the dorsum of the fundatrix casts some doubt on this statement. Periphyllus testudinaceus fundatrices feed on the lignified stems and the bursting buds and produce a second generation of winged and wingless viviparous females (see below) which feed on both the young shoots and the leaves. 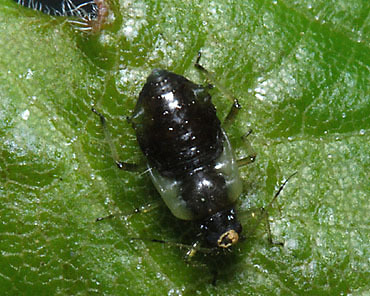 The first image shows developing nymphs of two colour forms of the common periphyllus aphid on sycamore in early May. The functional significance of the various colour forms is unclear. 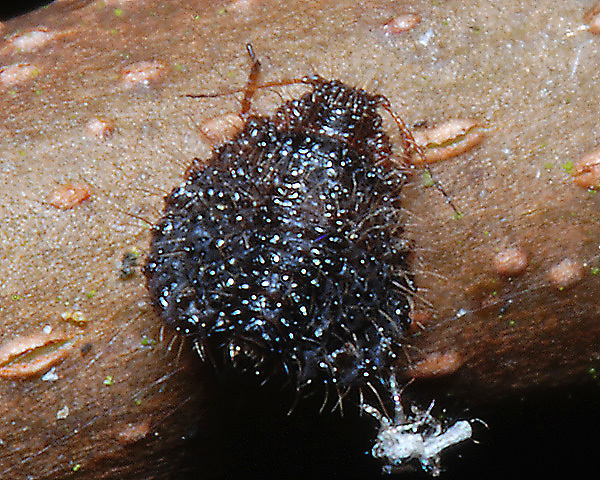 The second picture above shows a black form of an alatiform fourth instar nymph in late April. 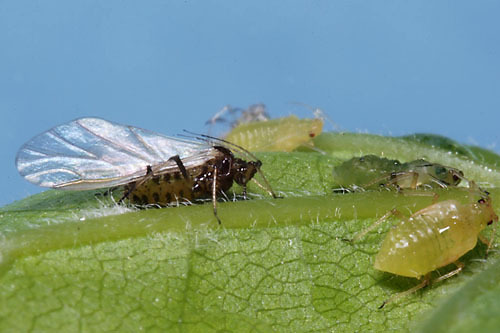 Numbers of winged and wingless second generation aphids generally peak in May. 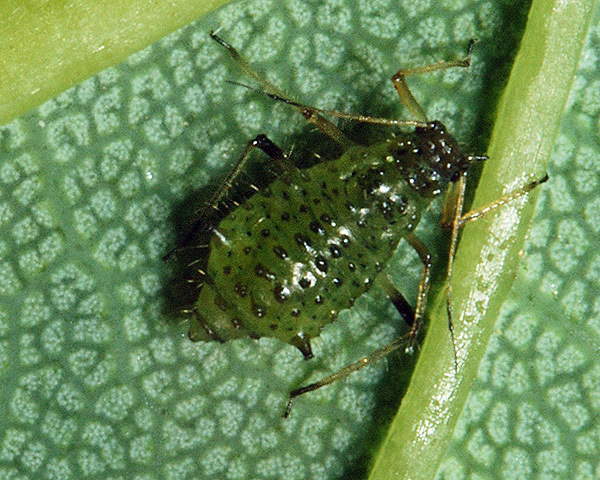 The common periphyllus aphid differs from other Periphyllus in being polyphagous amongst species of Aceraceae. 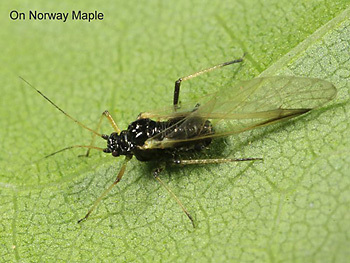 Whilst Periphyllus acericola is restricted to sycamore and Periphyllus aceris is largely restricted to Norway Maple, Periphyllus testudinaceus seems to thrive on all maple species. Wilkaniec & Szutukowska (2008) noted that population trends of Periphyllus testudinaceus in Poland varied between hosts, with numbers peaking somewhat later on field maple than on other hosts. The adult aphids of this generation then produce a very different type of nymph to get through the long hot (or cool wet!) summer period. The first image shows an alate of Periphyllus testudinaceus in mid-May which has been depositing very small (< 1 mm long) aestivating nymphs. 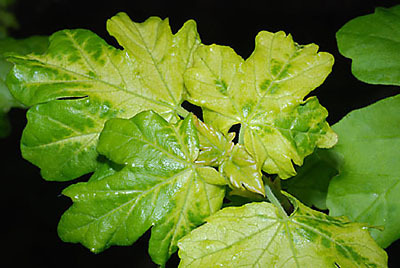 Two of these can be seen on the left hand side of the leaf. The second picture is a close-up. 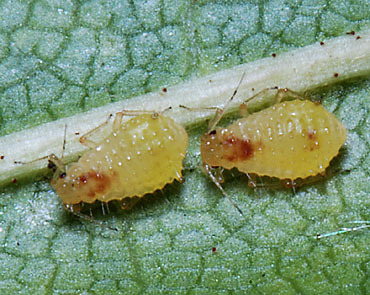 These nymphs are dorso-ventrally flattened, have foliate (leaf-like) hairs and are inconspicuous and solitary - quite unlike the clusters of aestivating nymphs of Periphyllus acericola. These forms aestivate throughout the summer and do not resume development until autumn when they mature to 'sexuparae' - the form that gives birth to the generation of males and females. The first picture shows a sexupara of Periphyllus testudinaceus on Norway Maple depositing nymphs in early October. The second picture shows two developing oviparae in October. 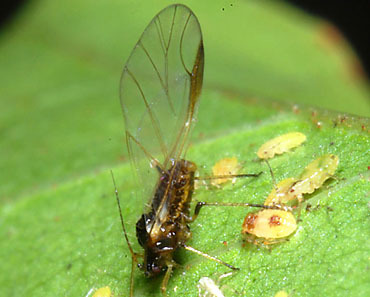 The wingless oviparae then mate with the winged males on the tree leaves. 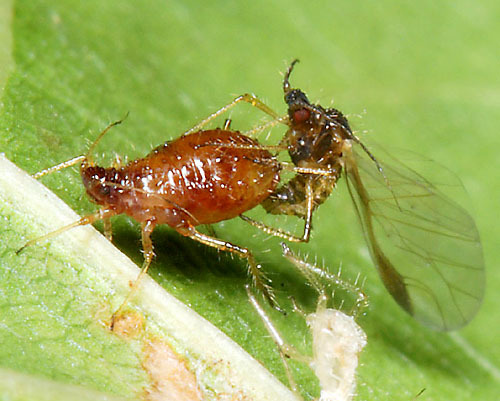 It is not common to observe mating aphids, but it is somewhat easier with this species than with many. The mated female then lays her eggs, which hatch the following spring. 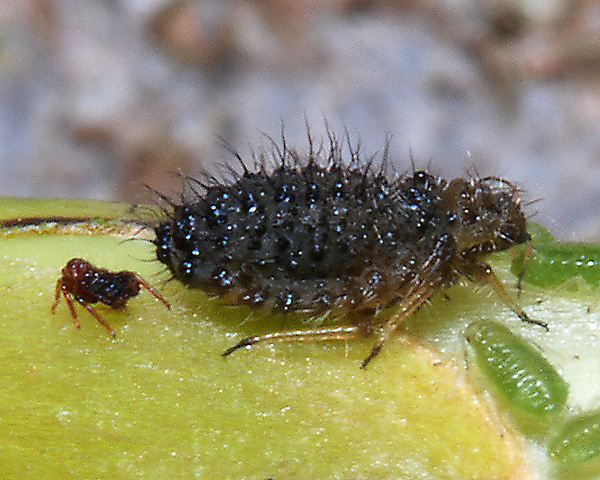 The common periphyllus aphid is usually attended by ants, although they do not usually attend the fundatrices. 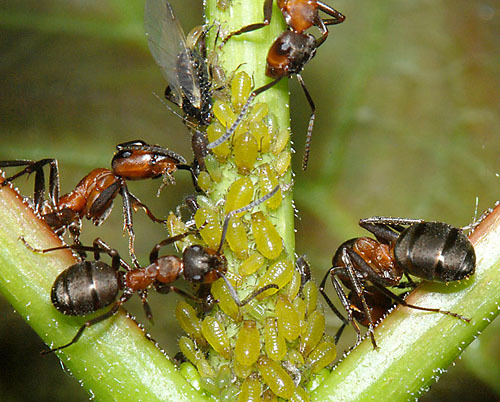 The picture below shows developing nymphs on a young shoot being tended by wood ants (Formica rufa). Skinner & Whittaker (1981) showed that populations of Periphyllus testudinaceus were significantly increased in the presence of the wood ant Formica rufa. When ants were excluded from colonies on shoots, a significant fall in numbers occurred presumably because of the action of predators. 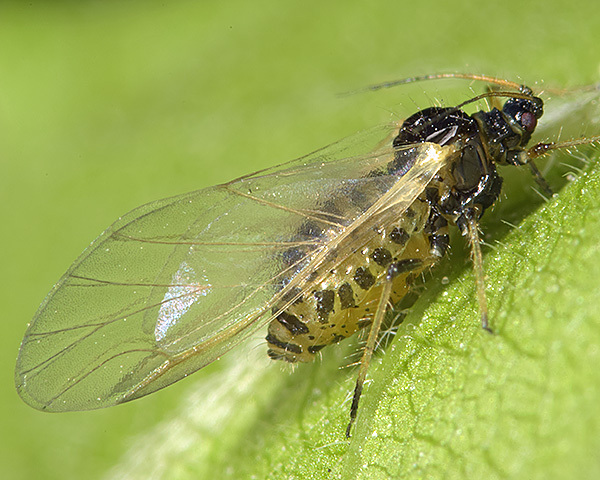 They also showed that leaf damage by Lepidopteran larvae was significantly reduced on trees on which wood ants tended this species of aphid compared to trees from which ants were excluded. In later ant-exclusion experiments in the same system, Whittaker and Warrington (1985) showed that the growth of sycamore trees was 2-3 times greater in the presence of ants and aphids, presumably as a consequence of herbivore suppression by the aphid-tending ants. Periphyllus testudinaceus may also be tended by other species of ant. The first image shows Periphyllus nymphs being tended by Lasius sp.. The second image shows Periphyllus testudinaceus alates being attended by Myrmica sp.. To what extent Lasius and Myrmica ants are able to suppress herbivore populations is unknown, but one should certainly not assume that they have the same effect as wood ants. Predation on ant-protected colonies seems rather rare, but Lasius seem to be somewhat less effective than wood ants at keeping predators at bay. We have found two types of predators attacking them in May. 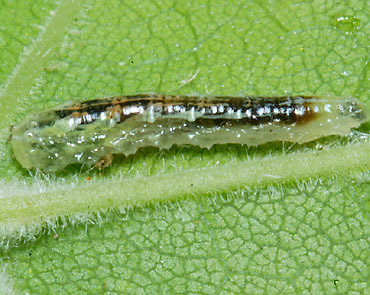 The first is syrphid larvae (first picture) which commonly attack colonies and the second is coccinellids. 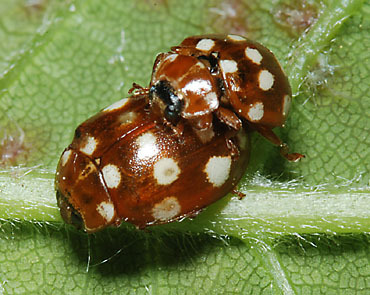 The second picture shows a mating pair of cream-spot ladybirds (Calvia quattuordecimguttata) on an infested sycamore leaf. 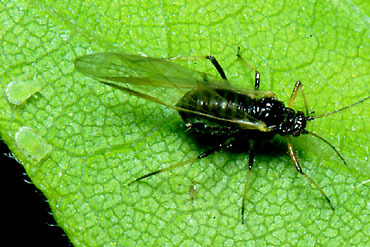 Periphyllus testudinaceus has been recorded from 27 Acer species. 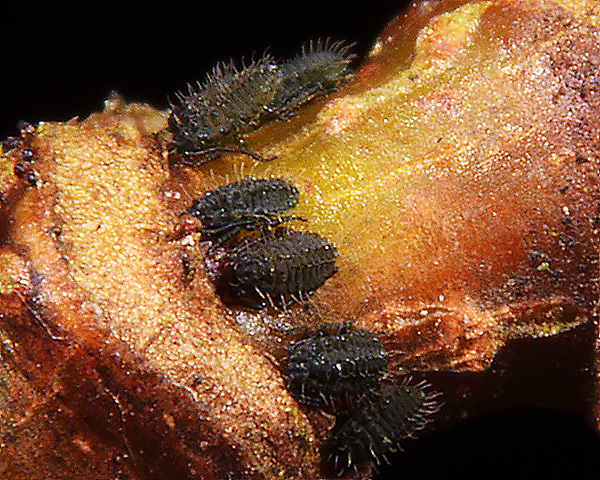 Blackman & Eastop list 96 species of aphid as feeding on Acer (Maples and Sycamores) worldwide, and provide formal identification keys. About fifteen of these are known to occur in Britain. Of the 22 aphid species on field maple (Acer campestre) worldwide, Baker (2015) lists 17 as occurring in Britain: Aphis craccivora, Aphis fabae, Aulacorthum solani, Drepanosiphum acerinum, Drepanosiphum aceris, Drepanosiphum dixoni, Drepanosiphum platanoidis, Mimeuria ulmiphila, Periphyllus acericola, Periphyllus aceris, Periphyllus californiensis, Periphyllus hirticornis, Periphyllus minutus, Periphyllus obscurus, Periphyllus testudinaceus, Stomaphis graffii and Stomaphis longirostris. Of the 8 species on Norway maple (Acer platanoides) worldwide, Baker (2015) lists 6 occurring in Britain: Drepanosiphum platanoidis, Periphyllus aceris, Periphyllus californiensis, Periphyllus lyropictus, Periphyllus testudinaceus and Stomaphis graffii. Of the 12 species on European sycamore (Acer pseudoplatanus) worldwide, Baker (2015) lists 8 occurring in Britain: Aulacorthum solani, Drepanosiphum acerinum, Drepanosiphum dixoni, Drepanosiphum platanoidis, Macrosiphum euphorbiae, Periphyllus acericola, Periphyllus testudinaceus and Stomaphis graffii. 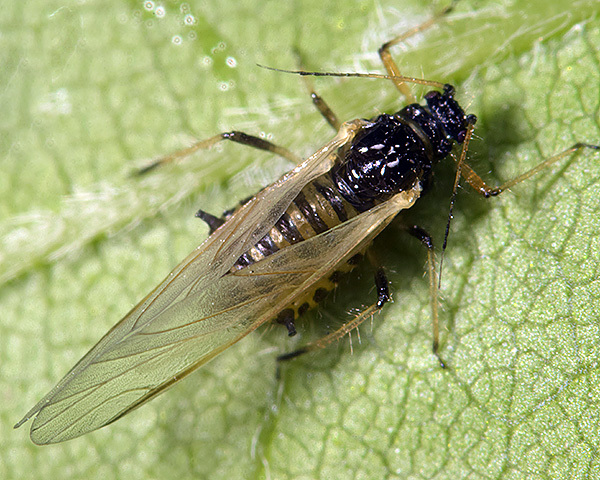 Periphyllus testudinaceus has been recorded from 7 Aesculus species. Blackman & Eastop list 5 species of aphid as feeding on horse chestnut (Aesculus hippocastaneum) worldwide, all of which Baker (2015) lists as occurring in Britain: Aphis craccivora, Aphis fabae, Aphis nasturtii, Aphis taraxacicola and Periphyllus testudinaceus. 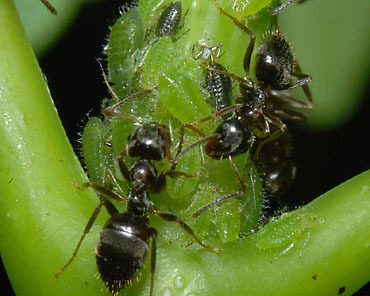 The net impact of Periphyllus testudinaceus on the host plant is complicated by the mutualistic relationship with ants. Maples fed on by the aphids usually show no obvious signs of feeding damage, although we did find yellowing of very young leaves of field maple in spring possibly caused (directly or indirectly) by a colony of the common periphyllus aphid on the underside of the leaf. Unfortunately as Styrsky & Eubanks (2007) have pointed out, exclusion experiments do not specifically test the effect of the interaction between ants and aphids. 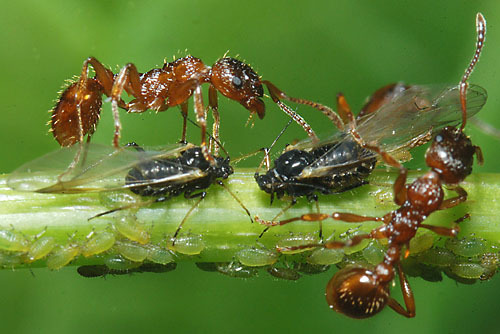 This is because ants forage for aphids as prey even when there are no honeydew-producing aphids present. Hence ideally one needs to carry out a factorial field experiment to compare plant growth between four treatments: no ants and no aphids; with ants and no aphids, no ants and with aphids, and with both ants and aphids. So far this has not been done for Periphyllus testudinaceus. Re. the sycamore aphid here, can't make out which one it is. I guess Periphyllus testudinaceus but mine has a marked wing like Periphyllus acericola but the wing spot isn't as dark as what I see on your site. 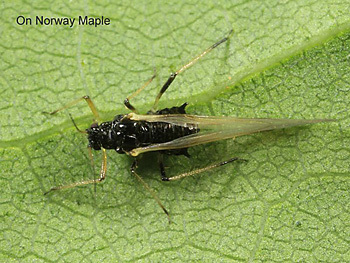 Re the aphid on Norway Maple, I'm reasonably certain it's P. testudinaceus. The tibiae have a very pale middle section contrasting with the dark base and tip. Also the pterostigma is brown, not black. In Sussex, P. testudinaceus is extremely common this year (as last), with relatively few Drepanosiphum platanoidis.